This weeks image comes from a study of the Collision of two Hopfians from Universidad Rey Juan Carlos in Madrid, Spain. In their recent Journal of Physics A paper, M Arrayás and J L Trueba consider the collision properties for two Hopfians, or Hopf–Rañada electromagnetic fields. The results make for some spectacular images as well as allowing the authors to show that by controlling the angular momentum of such fields, they can control the topology of the flow associated with the field lines, as well as the energy distribution. 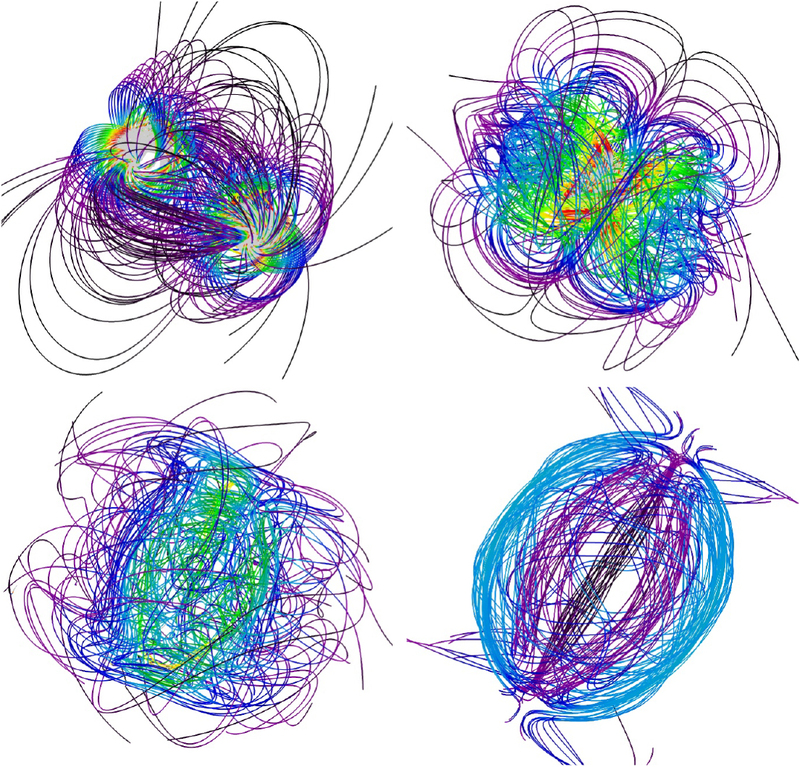 Magnetic field lines for the collision of hopfions with a null total angular momentum (J=0), at times T = 0, 2, 4, 6, from left to right and top to bottom. Image from M Arrayás and J L Trueba 2017 J. Phys. A: Math. Theor. 50 085203 © IOP Publishing, All Rights Reserved. A hopfion, or Hopf–Rañada field, is an example of an electromagnetic knot. The Hopfians are solutions of Maxwell’s equations in a vacuum, where the electric and magnetic field lines form closed loops, each of which is linked to another. Front and article image taken from M Arrayás and J L Trueba 2017 J. Phys. A: Math. Theor. 50 085203 , © IOP Publishing, All Rights Reserved.